SKU: 70113. Category: 1920s, Decades, Sold Items, Wedding and Occasion Wear. Tags: 1920s dresses, Burgh Island, vintage 1920s, vintage bridal, vintage tea dresses, vintage wedding dress. 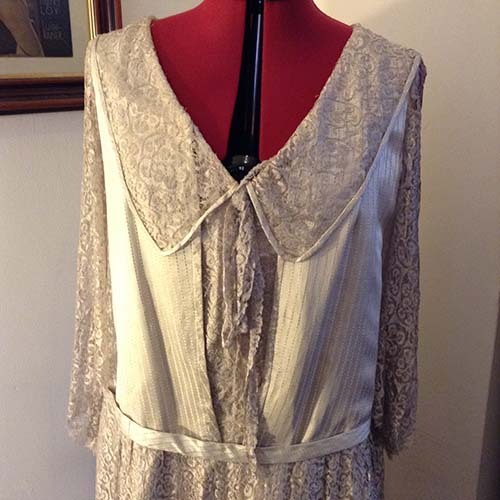 This is a beautiful silver grey Early Twenties dress. A gorgeous afternoon tea dress with a short train to help you glide across the lawn with your cup of Earl Grey – or Gin ‘n’ Tonic! Of course, with the short train falling from the waist this would be a beautiful bridal dress. Having looked at some clothing catalogues from the day, I think it could have been a 1920s Wedding Dress. 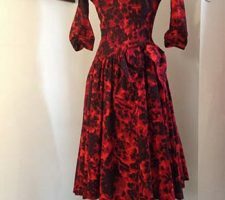 If you’re looking for a vintage bridal gown, this could be it! I’m not sure about the fabric of this lovely gown, possibly silk, but the construction of the piece is gorgeous. The lace front panel is secured by a number of popper fastenings. If you would like to see further photographs, please just send me an email karen@stardustyears.com. The silky lace is soft and delicate to the touch which adds to the romanticism of this gown. The lace sleeves fall just below the elbow with descending, scalloped edges. The train consists of 2 panels, which match the fabric of the bodice, and a centre panel of the same soft lace. Measurements: Bust: 40-42″ (measured flat across the back from under-arm to under-arm); Waist: 40″ (at its maximum – see note below); Hips: 54″; Length (from shoulder to hem) 50″; Short train falls an additional 10½” below the hem of the gown. So, similar in UK Dress Sizing as a Size 16-18 but the waist and hips can be drawn in by two tabs at the back of the gown. Condition report: She is vintage and she is almost 100 years old so she is not perfect but she is wearing her age extremely well. Better than me – and I’m a far bit younger! 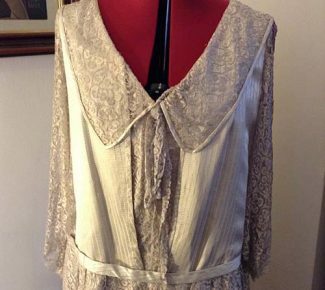 The lace on the collar needs a little repair as do one or two areas on the sleeves. Surprisingly, for a dress of this age and colour, there are only a few faint marks to the fabric. 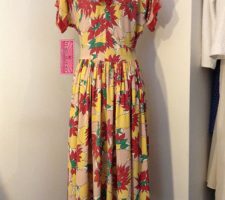 If you love this Early Twenties dress, you must come in and see her and try her on as words fail to describe how lovely she is. 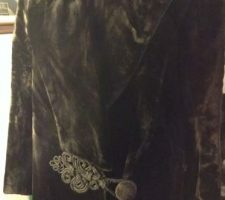 A beautiful piece of fashion history!